Pulse CMS has the tagline “Manage Content, Simply.” and with very good reason. I can login, add and edit webpages via a thoughtfully designed interface without needing to use FTP. While there are hundreds of content management systems available, Pulse is my choice because it does not use a database. This gives more control and less complexity for small websites like mine. Komodo Edit is a free source code editor with rich formatting for markup. Unlike most such software, which only let you edit local files, Komodo includes a built-in FTP module. This means I can edit website files while they're live on the web, even ones outside the scope of Pulse (such as scripts, style sheets, config files, and so on). This workflow is fantastic. Notepad++ is great when you don't need FTP. Like Komodo Edit, it offers rich syntax highlighting to make code easier to follow. One of its biggest strengths is the extent to which you can customise the interface. Change icons, colours and skins to your heart's content. FileZilla is great when you do need FTP. This is an intuitive open source file transfer client. FileZilla is just as capable when you need to quickly reconnect to your webspace to upload a single file, as when you need directory mirroring between your hard drive and server for hours on end. A staple of any web designer or developer's tool kit. Tsohost have been my web hosts since 2010. I could not be happier with their affordable, reliable and personal service. I'll never forget contacting their support team with a question on Christmas Day, and receiving a detailed reply within quarter of an hour! For more information, and the opportunity to save 10% on their cloud hosting packages, please read my full Tsohost review. …and finally, Webdesigners Toolkit. Their classic browser templates for Photoshop were invaluable when creating the timeline below! The BBC Two series Robot Wars was a staple of my childhood TV viewing. I contacted fellow fans on the unofficial website of series 2 champion Panic Attack, and took part in the forum's “Fantasy Robot Wars” fan-fic tournaments. This website documented my fictional fighting machines – not to mention my pre-teen verbosity and early efforts at digital graphics (Microsoft Paint with a dash of Paint Shop Pro). Panic Attack webmaster Jamie McGarry is now an acclaimed poet with his own independent publishing company, Valley Press. In 2004, I bought the domain name currently in the address bar of your browser. This coincided with the desire to relaunch my website as a personal homepage, as well as my appearance on the game show Countdown. 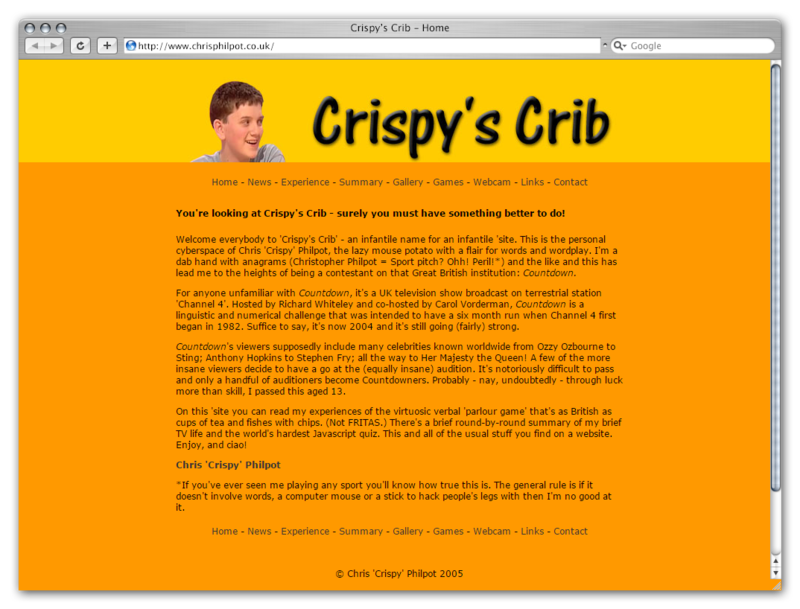 These factors collided with the creation of Crispy's Crib, a name inspired by the MTV series that toured celebrities' homes. 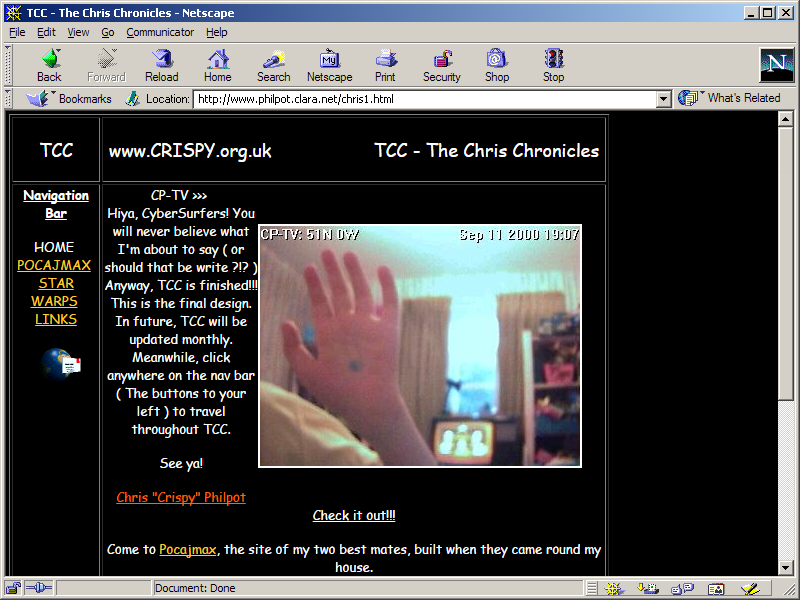 It was actually quite popular, not least because it wasn't blocked on my secondary school's computer network and hosted a plethora of Flash games (credit: Paul Neave). At sixth form college, I decided to pour my teenage angst into a blog. The result was every bit as cringeworthy as you'd imagine and maybe hope. 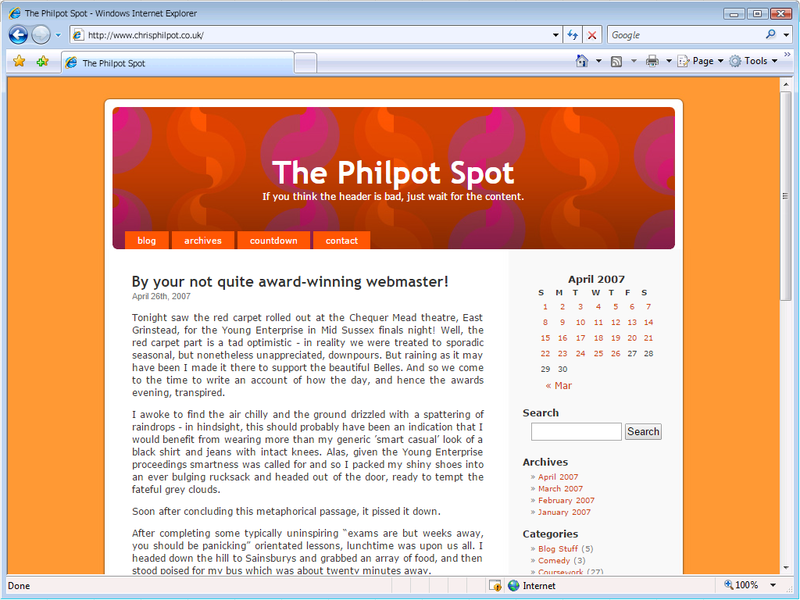 Started as an AS-Level Media Studies project, The Philpot Spot became my daily journal – just without the padlock. At one point, I built a streak of 169 consecutive days where I wrote at least one entry. Posts included jokes, poems, recommended YouTube videos (this predated Twitter), and details of some of my earliest ventures into working in TV. In-between unsubtle allusions to teenage crushes, naturally. More recently, my website has presented a more relaxed version of the information you'd otherwise find on my CV. 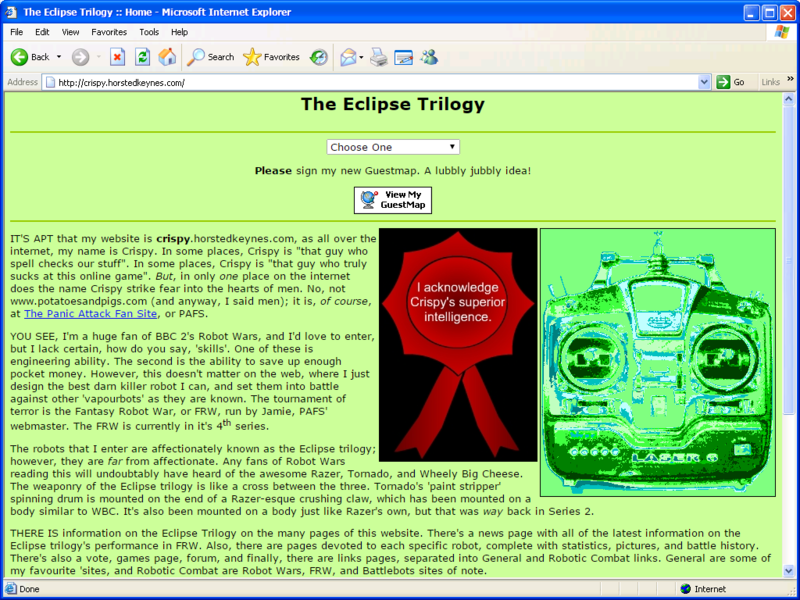 Upon graduation, I promoted myself via an innovative one-page website that scrolled between different topics. 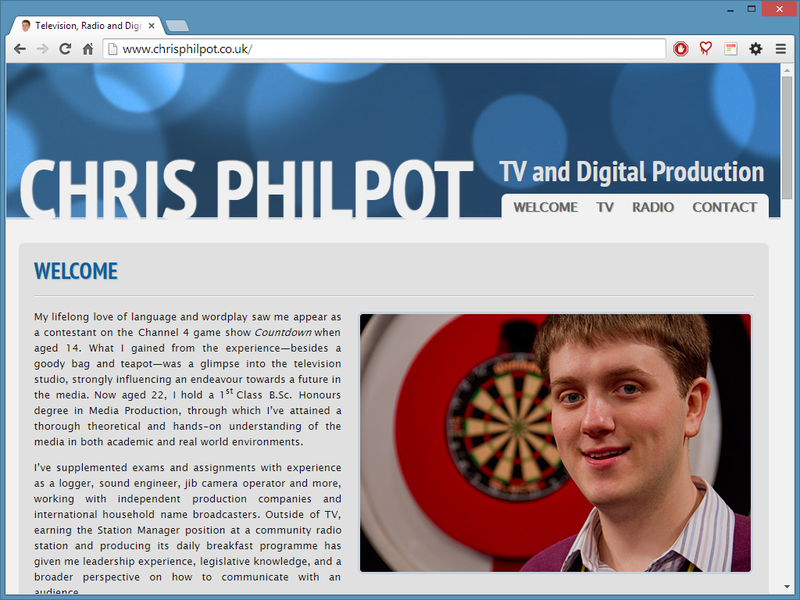 It had video clips, audio showreels, and details of my work on TV and radio projects. 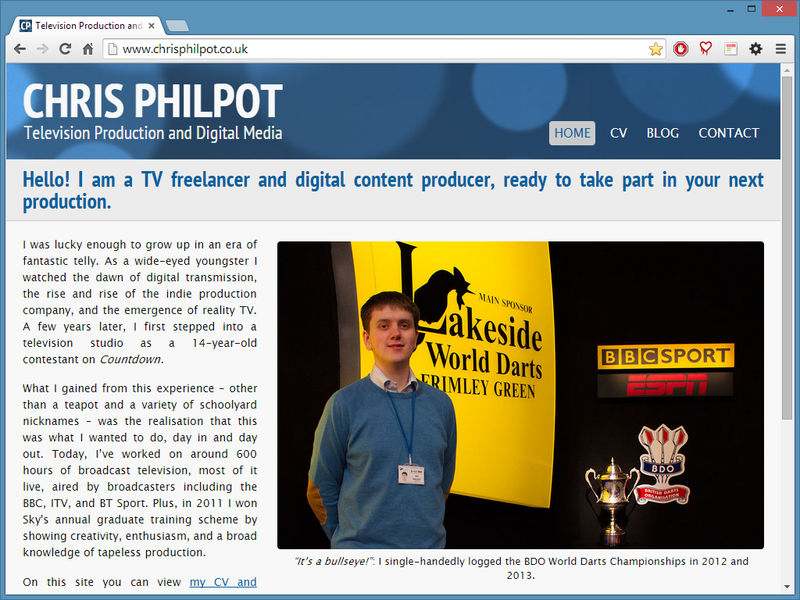 In 2013, I relaunched my website with a responsive design, lots more textual information, and a blog with my thoughts on trending topics in television and technology. These two sites established the foundations of the one you're reading today!